Designed by Mésarchitecture for the Shenzen and Hong-Kong bi-city biennal of Urbanism/Architecture, the “Double Happiness” was exhibited from December 06, 2009 to January 23, 2010. Double Happiness responds to the society of materialism where individual desires seems to be prevailing over all. 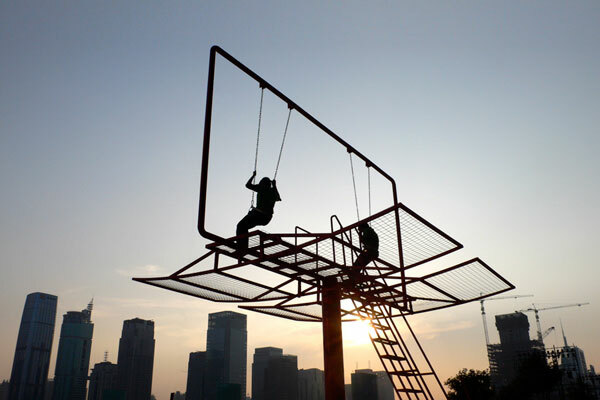 This piece of urban furniture, by being nomad, allows the reactivation of different public spaces. It enables inhabitants to reappropriate fragments of their city. They will both escape and dominate public space through a game of equilibrium and desequilibrium. By playing this “risky” game, and testing their own limits, two people can experience together a new perception of space, void, lightness and recover an awarness of the physical world. This hybrid object, meaningfull only through the body, being all at once physical and social may be a tool for a collective experience of fragility. Examining and engaging discussion on the latest urban design and landscape architecture projects from around the world. Not for the faint-hearted.